The conditions in the mobile dunes are difficult and only a few species of plants can grow here. The dominating plant in the active, white dune near the sea is the grass Ammopihila arenaria. It has a very long and much branched root-system so it can quickly grow through the dune and stabilize it. Other grasses important in the building of the white dunes are Leymus arenarius and Elymus farctus. When the white dunes become more stabilized some other plants establish. 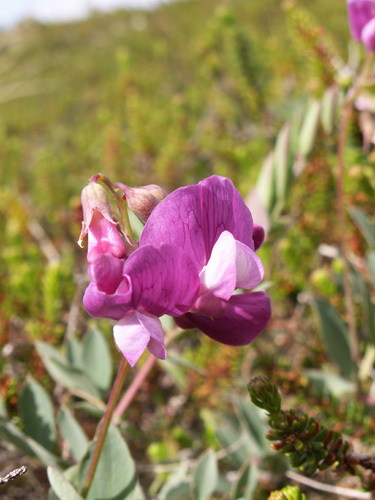 At the right is a photo of Lathyrus maritimus, which is a common species all along the west coast of Jutland. A close relative can be seen on coasts in the inner danish waters. 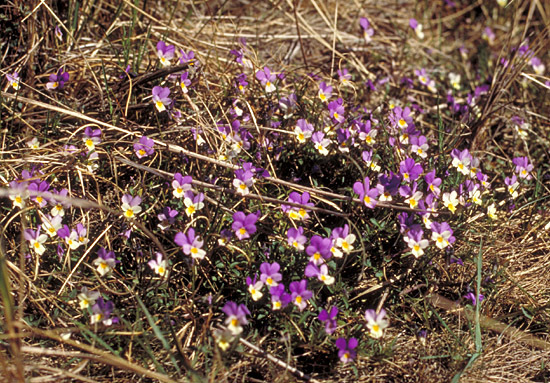 Another beautifull plant in the white dunes is Viola tricolor ssp. curtisii (below). It is a close relative to Viola tricolor ssp. tricolor, which is common on sandy soils througout Denmark. The ssp. tricolor is an annual where ssp. curtsii is a perennial that can form small colourfull blankets in the dunes. Other common plants in the white dunes i Jutland are Carex arenaria, Rosa pimpinellifolia, Hippophaë rhamnoides, Salix repens ssp. arenaria and Corynephorus canescens. Back to sanddunes along The Westcoast.